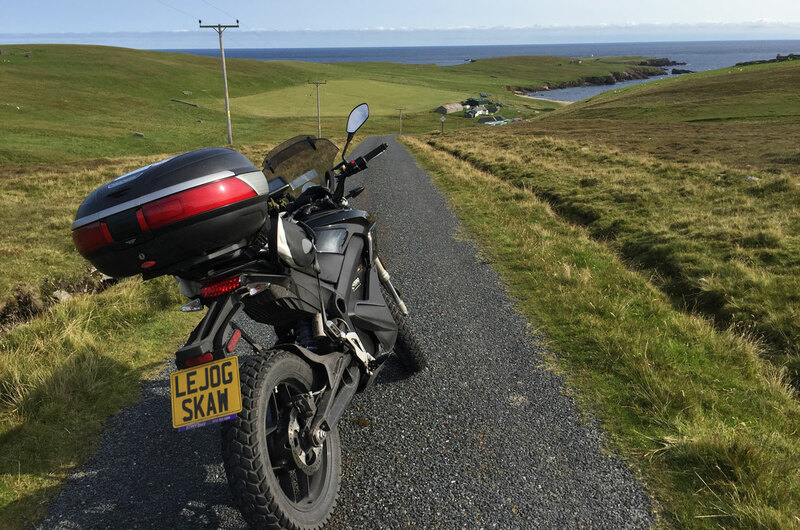 The first electric motorcycle journey from Land's End to John o'Groats and the continued journey from there to the real top of the UK: Skaw on the island of Unst, Shetland. 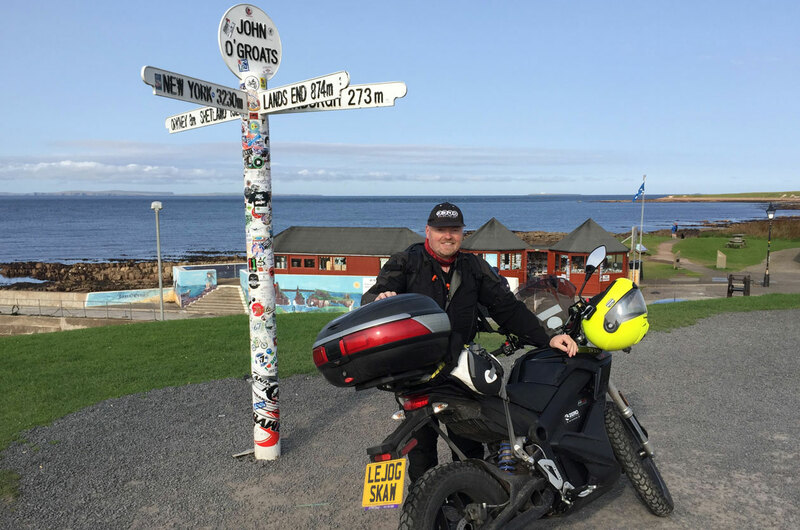 On 18th August, 2017, electric vehicle enthusiast and owner, John Chivers, became the first person to undertake a journey on an electric motorcycle from Land's End to John o'Groats. He then continued his journey to Skaw, at the very top of the UK on the island of Unst, Shetland. The mainland part of the journey, from Land's End to John o'Groats, saw John cover a distance of 1409 km (875.51 miles) and was completed over four days, between Friday 18th August and Monday 21st August. 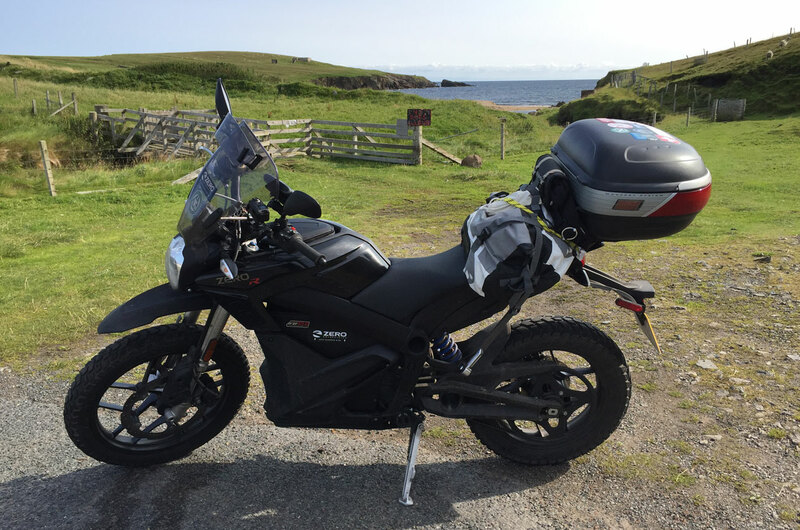 On Tuesday 22nd August, John and his bike took the ferry from Scrabster on the UK mainland to Stromness on Orkney. An overnight ferry then took him from Kirkwall on Orkney to Lerwick on Shetland, from where he rode to Skaw at the very top of Shetland, thereby completing a trip from the bottom to the top of the UK. 09:00 James Coates and I load the bike and my stuff into a hire van and James drives us down to Cornwall. 14:20 Arrive at Weaver's Bed and Breakfast, Sennen, Cornwall, less than a mile from Land's End. James and I take a few photos, have a couple of drinks of tea, then James heads back home. I spend the remainder of the afternoon preparing and take the opportunity to have the classic photo taken at the Land's End signpost. 07:45 Depart Land's End. Thanks to the only other person around, Louise Thompson, who has just seen her husband set off on his ride to John o'Groats by bicycle, the moment is captured on camera. 10:30 Arrive at first charging stop, Upcott House, Okehampton. Kay and John Bickley, the owners keep me entertained while the bike charges, offering me hot drinks and tours of the impressive eco equipment they've installed, including PV, an air heat exchange pump, and battery storage. 14:09 Depart Upcott House, fully charged. 17:15 Arrive at Sidcot Arms, Winscombe. After a bit of hunting around, we run a couple of extension leads through the window to charge the bike. While it recharges, so do I with some culinary delights. 19:50 Depart Sidcot Arms, fully charged. 22:30 Arrive at Grove Farm B&B, Kimbolton following a very blustery ride across the Severn and up through Monmouth. 07:17 Depart Grove Farm B&B, after an overnight charge in a stable. No, really! 09:48 Arrive at first charging stop, The Partridge, Stretton, having met up with biker friend Chris, on the outskirts of Shrewsbury. Nice pub, which does some great breakfasts. 13:25 Depart The Partridge, fully charged. 16:34 Arrive at Duke of Cumberland pub, Kendal, Cumbria, following a predominently built-up stretch of riding through England's North West. Forced to reluctantly concede again though, as a Yorkshireman, that parts of Lancashire are actually nice. Now, let us not speak of this again! 19:26 Depart the Duke of Cumberland pub, fully charged. 20:33 As suspected, I can't do the rather long 100 mile stretch of the journey, including climbs up the Cumbrian gradients and the upcoming motorway climb into Scotland without a shorter stop to charge. Thanks to Polar's chargers at ASDA in Carlisle, this is relatively straightforward, and, while I'm charging, I strike up conversation with local, Paul Higgins, on the subject of eco tech and infrared heating panels. 21:47 Depart Carlisle, not fully charged, but with just enough to make a difference. 23:12 Arrive at Holmlands Bed and Breakfast, Crawford, after a mammoth power-management session. That climb into Scotland, combined with the strong winds, really takes it out of the bike's power. 09:24 Depart Holmlands Bed and Breakfast at a more civilised time. As only one daytime stop is planned, today should be a little more leisurely. 12:26 Arrive at Fendoch Guest House, near Crieff, and it's a warm welcome. I found the guest house through the Plugshare site, and Graham kindly offered me the use of the guest house's level 2 Mennekes charger. I'm made to feel most welcome, and Nan insists on plying me with tea and a bite to eat. Lovely people in a lovely guest house, in a lovely location. 15:21 Depart Fendoch Guest House, fully charged. 17:58 Arrive at The Cairn Hotel, Carrbridge, following a spectacular ride through the Cairngorms and past old family holiday haunts around Aviemore. Nice hotel in a beautiful location, with friendly staff. I'd forgotten the joys of Scottish midges though! 11:34 Arrive at the Sutherland Inn, Brora, on the north east coast of Scotland, and it's another warm welcome. I get chatting to a couple of locals, Donnie and Billy, both of whom refuse to let me buy them drinks, until Billy finally relents, just before I head off. Donnie, who it transpires is a retired nuclear electrician, shoves £20 in my hand for my fundraising efforts. Salt of the Earth! 15:18 Depart the Sutherland Inn, fully charged. 17:02 Arrive at John o'Groats. Main part of the mission accomplished! 17:46 Depart John o'Groats, heading for my base for the night. 18:11 Arrive at Bencorragh House in Upper Gills, delighted to have completed the main part of the journey and looking forward to the next three days on Orkney and then Shetland. 07:11 Depart Bencorragh House early for the ferry from Scrabster to Stromness. 07:43 Arrive at Scrabster ferry terminal. 08:45 Ferry (MV Hamnavoe) from Scrabster to Stromness. 10:19 Following a straightforward and smooth crossing from Scrabster to Stromness, I first take the opportunity, as it's my first visit to Orkney, to visit the obvious historic tourist sites, before heading to Kirkwall to meet up with Jonathan Porterfield of Orkney-based Eco Cars. Jonathan very kindly shows me around, taking me for an interview with BBC Radio Orkney he has managed to arrange, then to meet various people to show them the bike. Next, we shoot some road footage and head to Hammars Hill Wind Farm to record a small chat to camera. Then, we head to Jonathan's house, where he kindly lets me charge the bike, while we first record me interviewing him, then head into Kirkwall to attend a meeting and thereafter for a bite to eat, before returning back to Jonathan's house, at which point I head off to Kirkwall's ferry terminal. 23:45 Ferry (MV Hjaltland) from Kirkwall to Lerwick. 07:43 Disembark from MV Hjaltland ferry at Lerwick and head north. The weather is kind. 08:43 Take the ferry from Toft, Shetland mainland to Ulsta, Yell. 09:03 Disembark ferry at Ulsta, Yell. 09:32 Take the ferry from Gutcher, Yell to Belmont, Unst. 09:44 Disembark ferry at Belmont, Unst and head straight to Skaw. 10:21 Arrive at my ultimate target destination, Skaw Beach, at the most northerly publicly-accessible part of the UK. 11:13 Heading back from Skaw, I stop off at the nearby Pure Energy Centre in Baltasound and meet Ross Gazey, who kindly permts me to charge the bike while we talk all things eco tech. I fear I am a bit of a disruptive element and so make at least a token effort to help with some lifting of wind turbine blades. 15:18 Fully charged (probably for a while), I bid farewell to Ross and head back to Shetland's mainland to stay with my brother and family, while the weather takes a decidedly moist turn. 17:32 Arrive at the house of my elder brother and family, south of Lerwick on Shetland mainland, coincidentally a mere minute or so before he returns from work. Morning The mission now completed, the weather is grim outside, so I spend the morning at my brother's house, starting to assemble materials in terms of photos and video clips, as well as putting together collateral for this Web content. I talk with local press in Shetland - The Shetland Times and Shetland News and then partake in an interview over Skype with ITN for Channel 5 news. 13:00 Having packed and caught up with my niece and nephew, I head into Lerwick to meet my brother for lunch together. Nice to catch up, as always. He then shows me to BBC Radio Shetland, where I have an interview, before I return to the Toll Clock shopping centre to kill some time before my evening ferry back to the UK mainland. 17:00 Check in at Lerwick for the return sailing to Aberdeen. 19:00 Ferry (MV Hrossey) from Lerwick to Aberdeen. 07:04 Disembark ferry in Aberdeen and head to Forfar, 52 miles away. 08:08 Arrive at the McDonald's at Forfar, just off the A90, where I find James awaiting with the rental van. He has been an absolute hero and been invaluable to the whole trip, having initially driven me down to near Land's End to begin the journey and now driven all the way up to Forfar to collect me and the bike for the return home. After some required coffee intake and having loaded the bike and me having changed into 'civvies', we head off for the journey back. 18:30 After a long drive down from Forfar to Warwickshire, in which James skilfully avoids the worst of the Bank Holiday tailbacks on the M6, we arrive back home. John Chivers has followed the development of electric vehicles into the mainstream in the last few years, closely following early adopters and proponents on social media (notably Robert Llewellyn and Bjørn Nyland), and after a certain amount of 'waiting for the right moment', took the plunge in 2014 by selling the family diesel car and buying a pre-owned Nissan LEAF, which remains the sole family car to this day. 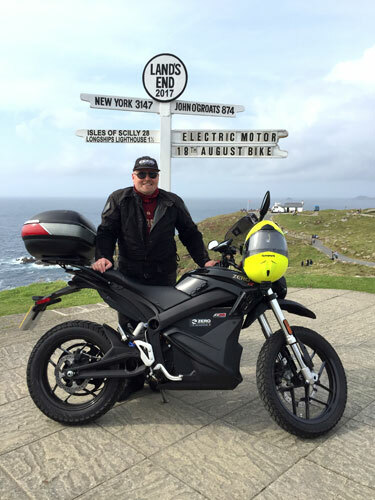 In June of 2016, John, who is a volunteer observer for his local Institute of Advanced Motorists (IAM Roadsmart) group, Coventry and Warwickshire Advanced Motorcyclists, decided that it would also be a good move to make the move to electric on two wheels, took the plunge and bought a 2016 Zero DSR ZF13 electric motorcycle. 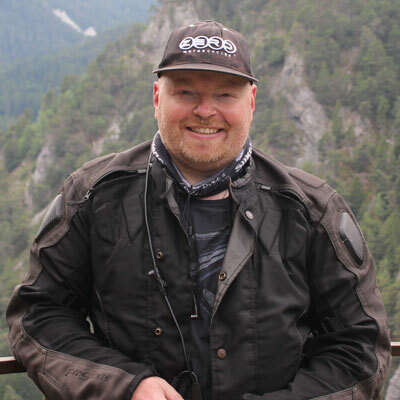 He has found that much of his riding, including most of his observer activities, can be undertaken on the Zero motorbike. 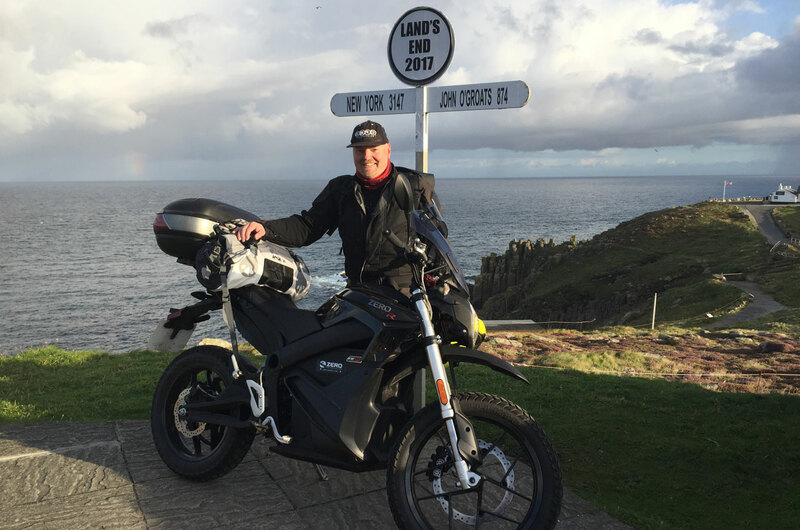 He produces occasional vlogs on his YouTube channel relating to the realities of driving the Nissan LEAF and riding the Zero electric motorbike and is now the first person to have ridden an electric motorcycle not just from Land's End to John o'Groats, but indeed on to Skaw at the very top of the UK! What is the make and model of the bike? It's a 2016 Zero Motorcycles DSR ZF13.0 electric motorcycle, with a nominal 13 kWh battery but an actual 11.4 kWh useable capacity. Is it your own bike? Yes. I have owned an electric motorcycle since June, 2016, along with my 2007 Honda CBF 1000 petrol bike. How far will the bike go on a single charge? The short answer is around 100 miles. The correct answer, however, is that it depends on how power is used. Manage the power carefully and you can keep the attainable distance between charges quite high. Thrash the bike and the range drops significantly. For the purpose of this trip, I planned to cover an average distance of 85 miles between charges, because I was carrying extra load and wanted to allow myself a safety margin. How long does it take to charge the bike? Using the integrated 1.3 kW charger alone, the charge time is approximately 9 hours. For the purposes of this trip, I needed a quicker means of charging. Fortunately, my Zero dealership, Streetbike in Halesowen, managed to obtain from Zero in the Netherlands the loan of couple of additional external fast chargers, which added an additional 2 kW combined power, meaning I was able to charge at a total 3.3 kW and reduce charging time to around three hours. What's the top speed, 0-60 mph (0-100 hm/h) time, max power, max torque, and weight of the motorbike? 98 mph (158 km/h), 3.9 seconds, 67 hp (50kW) @ 4000rpm, 144 Nm (106 ft-lb), and 190kg (490 lb) respectively. How does it compare to riding a petrol motorbike? In many ways it's very similar. The key differences are the instant torque of an electric motor and the lack of gears. Having no gears means that slow riding is more a combination of solely rear brake and throttle control, rather than a combination of clutch and rear brake control on a normal petrol bike. Otherwise, the bike feels the same to ride. There is no particular difference in characteristic in terms of weight distribution. The bike does indeed gain the weight of a battery, but loses the weight of a traditional engine. How can you possibly ride a motorbike which doesn't make a noise? With great pleasure. I ride motorbikes because I enjoy the experience of riding. The noise a motorbike makes has never been of much interest to me and I don't subscribe to the loud pipes save lives school of thought. What saves lives is a combination of rider skills and luck. In fact, I would argue that the benefit of hearing vehicles when approaching junctions is far more benefical than loud exhausts warning other road users of your presence. Where can I find out more technical details? The Zero Motorcycles website has a technical specification page on the bike. What's the one thing you would change on the bike? Make rapid charging a huge priority in development. This will remain the biggest obstacle to mass adoption. Motorbikes are expensive and many people can only own one. If they have to make a choice of being able to do longer journeys on a bike or not do longer journeys without a great deal of effort or expense, they'll of course go for the former. While a key purpose of my trip was to demonstrate what electric motorcycles are capable of, there is no technical reason why the bike I rode shouldn't be able to be charged in around 15 minutes using DC charging. Once that's in place, sales will rocket. According to the GPS logs, it took 23 hours and 47 minutes of riding time from Land's End to John o'Groats. That was split over four days. I then spent a day on Orkney, where I spent 1 hour 52 minutes riding the bike (visiting sights and people), before catching the overnight ferry to Shetland. On Shetland, I rode from Lerwick to Skaw at the top of Shetland, which took an additional 2 hours 6 minutes of time on the move. That was the target reached as far as the goal of the journey went. On that basis, it took a total moving time of 27 hours and 45 minutes. What was the cost in electricity? The journey from Land's End to John o'Groats used 137 kWh of energy. The journey from Land's End to Skaw Beach used 153 kWh of energy. On the basis of my own electricity bill, assuming all of this was paid for by me (at 11.77p per kWh), the journey from Land's End to John o'Groats would have cost £16.12 and the journey from Land's End to Skaw Beach would have cost £18.00 exactly. I rode from the bottom of the UK to the top for under £20 in fuel. By contrast, the diesel cost for James to transport the bike down to Land's End for journey's start and to collect me from Forfar was over £200. Did the battery ever run out of charge or did you break down at all? How long did it take to charge? During the stops I made during the day, around three hours. For the overnight stops, I was able to use just the bike's one built-in charger and let it charge overnight. Did you have to make any unplanned stops to charge? No. However, one section of the journey, from Kendal to Crawford required a 100 mile stint, which I knew was almost certainly going to be too much, given that the roads on that leg (the M6 and A74(M) motorways) comprised motorway sections on a constant climb and were higher speed roads. As such, I made contingency plans to stop at an ASDA supermarket in Carlisle and charge for a time using one of the Polar charge points. In the event, I did stop there for an hour or so in order to ensure I had enough charge to complete that section of the trip. Do you have a map of the route you took? Yes. See the Route section. As yet, I haven't taken any action in terms of recording the journey as a record. Guinness tends to deal in superlatives: fastest, biggest, etc. That was not the nature of my desire to undertake the journey. At the outset, I decided to enjoy the experience over a number of days rather than attempt to set a speed record. Any record registered with Guinness could easily be broken, especially as electric motorcycles improve in terms of range and charging times. I was far more interested in proving the technology capable and, yes, of being the first to do it. Why did you do the trip? I support the wider adoption of electric vehicles and wanted to prove that such a journey could be done. Nobody else had done it. It seemed like a good way to do some fundraising. Did you learn anything on the trip? I learnt that in all the cases I encountered, people are very encouraging towards someone undertaking a challenge. Everyone I met was friendly and keen to support me. Nobody asked for any money in return for using their electricity. Sure, it wouldn't have amounted to much financially, but it was still a nice gesture on their part. Meeting friendly people was by far the most positive experience of the trip, outside the sheer enjoyment of riding itself. 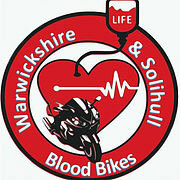 Warwickshire & Solihull Blood Bikes is a group of volunteers, and a member of the National Association of Blood Bikes, who offer a voluntary, out-of-hours service to the NHS by using motorbikes to move blood, plasma, tissue samples, documentation and other vital supplies between hospitals, hospices and supply centres. Tommy's funds research into pregnancy problems and provides information to empower parents to have a healthy pregnancy. 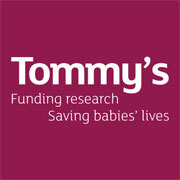 Today, Tommy's funds four maternal and foetal research centres across the UK. Alex, Jason and the staff at Streetbike, Halesowen for their support, without which, the project would not have been possible. For having the vision to build an electric motorbike and for the loan of the fast chargers for the duration of my trip. For the discounted lead to enable fast charging from Level 2, Mennekes public charge points. This was extremely useful. For sponsoring the trip by covering the cost of my and my motorbike's three crossings from Scrabster to Stromness, Kirkwall to Lerwick, and Lerwick to Aberdeen. For his time and willingness to show me around during my visit to Orkney and his support of my challenge as a fellow EV "End-to-ender"! For inadvertently inspiring me to do the trip with a question which sparked a throwaway comment on my part, for his and Kate's support throughout, and especially for taking two days' holiday to drive me and the bike firstly down to Land's End and then for coming to meet me on my return, 50 miles from Aberdeen in Forfar. Special thanks to those who allowed me to charge the motorbike at no cost whatsoever, which was everyone at every point on the journey. Finally, an extra special thanks to those who have made donations in support of the two charities for which I'm fundraising. If you are a member of the press and you wish to contact me regarding any coverage or information about the journey, feel free to use the form opposite to do so. There is a wealth of information and coverage of the trip on the Facebook page in particular, but if you have any specific requests regarding source materials, I would be happy to assist.